Chef Tory’s sauces shine as salad dressings, marinades, and garnishes to add a pop of color to your plate. 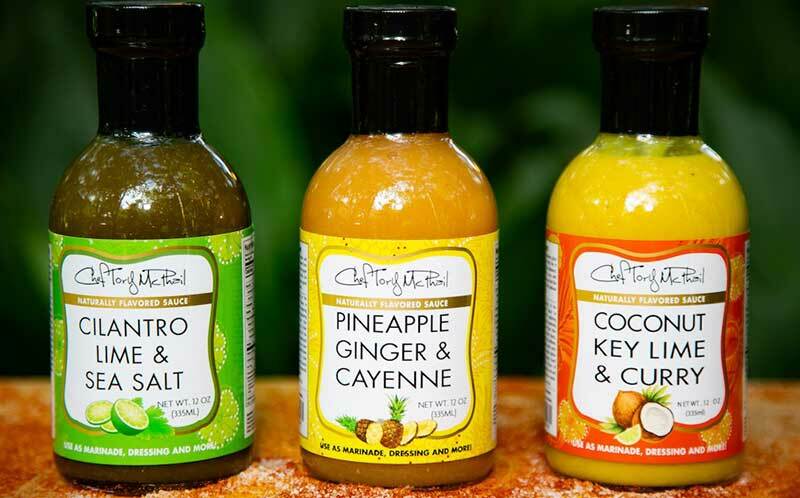 Chef Tory’s bottled sauces find inspiration in the tropical roots of Creole cuisine and feature bright flavors without stabilizers, artificial colors, or added fat. Chef Tory’s sauces draw on New Orleans’ identity as “the northernmost city in the Caribbean,” where history, people, and culture create a rich tapestry with a strong Caribbean/Creole flair. They also reflect Chef Tory’s passion for island food. He fell in love with the culture and the laidback vibes of island life during a stint at the Mongoose Restaurant in the U.S. Virgin Islands. His line of sauces captures the essential flavors of the Caribbean, prepared with the sophistication of a well-travelled executive chef at the iconic Commander’s Palace in New Orleans. These simple, intense flavors can make you feel like you’re on an island vacation. Chef Tory worked with a food scientist Darryl Holliday at Holy Cross College for a year to distill and bottle his daily culinary experiences at Commander’s Palace. The result is shelf-stable, but still with natural ingredients. Each sauce has multiple uses, and can function as a standalone sauce, seasoning, marinade, or condiment. These sauces are no usual suspects, either. Chef Tory wanted to create something different from the three types of sauces you can typically find in the supermarket: the oil and vinegar dressing (heavy on the oil), the barbecue sauce typically made with tomatoes and brown sugar, and the type of vinegar with salt and chili (one example would be Louisiana hot sauces). Chef Tory’s sauces contain no tomatoes, no brown sugar, no oil, and no vinegar. Coconut, Key Lime & Curry: To marinate, glaze, and slow-BBQ meats and seafood. Pineapple, Ginger & Cayenne: Perfect for marinating fresh seafood for ceviche and BBQ shrimp, or as a sauce for any warm-weather dish. Cilantro, Lime & Sea Salt: As a marinade for both seafood and meat. Great for grilling, or for use a sauce or a condiment. Chef Tory’s sauces are available for $6.49 each and can be purchased through Chef Tory’s online store, or at local grocers like Walmart and Rouses.